When files are uploaded into ResourceSpace they are stored in their original form but derivative files in other resolutions are also created and stored alongside the resource. 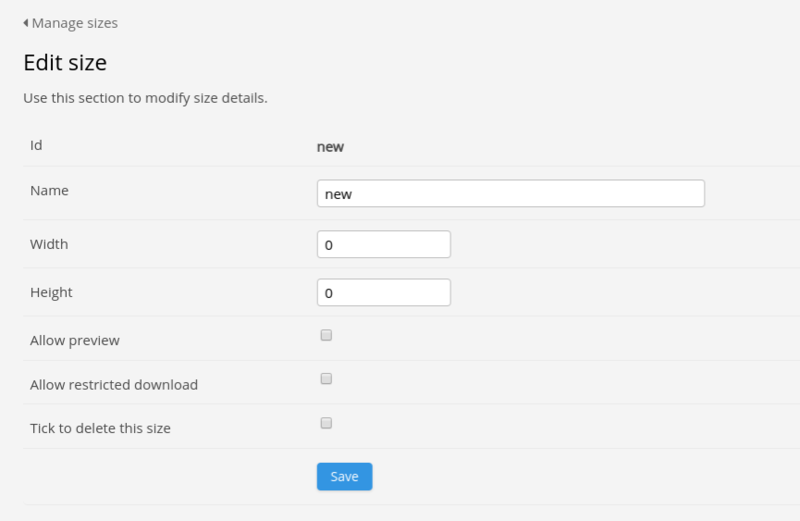 The default sizes of these derivative files are appropriate for most uses, however you may require a specific size to be available, new sizes can therefore be configured in Admin -> System -> Manage Sizes. Create a new Size and define its dimensions by setting the number of pixels in its height and width. Note: The height:width ratio of the original resource will be maintained within the dimension parameters. At this time, you will have the option to decide if an on-screen preview should be made available for the new size. You can also decide whether it should be available for download by users with restricted access to the resource, perhaps for granting them access to a smaller version of an image than the original. The file for the new size derivative will be automatically created for future resources, however previews will need to be regenerated for resources previously uploaded.